CM Magazine: Bun Bun's Birthday. Richard Scrimger. Illustrated by Gillian Johnson. Toronto, ON: Tundra, 2001. 24 pp., cloth, $15.99. ISBN 0-88776-520-3. The cake had yellow icing and little pink roses, and writing. There was a teddy bear in the center. It was a beautiful cake. "What does the writing say?" asked Winifred. "It says, Happy Birthday, Bun Bun," said Mommy. "Bun Bun?" said Winifred. "It's her very first birthday today," said Mommy. "She is one year old." "Bun Bun? This cake is for Bun Bun?" Winifred frowned. "The decorations are for Bun Bun? The party is for Bun Bun?" "That's right," said Mommy gaily." Everything's for Bun Bun." Winifred ran from the room. 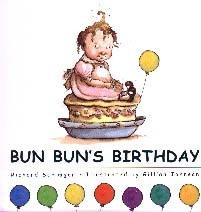 When Winifred, the big sister in Scrimger's story, Bun Bun's Birthday, discovers that the cake, streamers and balloons are for baby Bun Bun's party and not her own, she is anything but pleased. How can this be, she wonders, if her birthday is always next after Eugene's? Feeling left out and annoyed, Winifred retreats to her room to sort out the situation on her own. Eventually, Mother has a discussion with her, and Winifred concludes that, as Bun Bun's older sister, she will have the important role of telling Bun Bun all about her very first birthday party. By the time the candle is lit, the entire family is ready to celebrate. 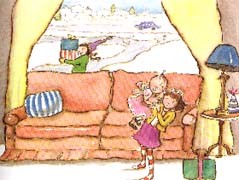 Through the character of Winifred, Richard Scrimger, author of The Nose from Jupiter and A Nose for Adventure, conveys the mixture of emotions common to youngsters attending someone else's birthday. The resolution is particularly satisfying as Winifred is able to solve the problem on her own with typical childhood logic. While Scrimger's quirky, conversational writing style is effective in expressing each character's personality and mood, at times, it makes for choppy reading. Illustrator Gillian Johnson's paintings are full of emotion and festive colours. Unfortunately, much of the artwork is small in size, and details in the scenes and character's faces may be lost in large group sharing. As well, the book cover is not overly appealing compared to other pages in the book. Ultimately, however, Winifred's emotions in the tale ring true and make this birthday book worth the read. Lisa Sykes, who has worked as an early years teacher and teacher-librarian in Winnipeg, MB, is currently on maternity leave and is enjoying her time at home with her two young children.